Info "Escape by jumping your scooter. The trick is, you gotta land it perfectly! Think you got the skill?" Scooter Commuter is a microgame in the Sci-Fi folder in WarioWare, Inc.: Mega Microgame$!. A person on a motorcycle jumps off of a ramp. 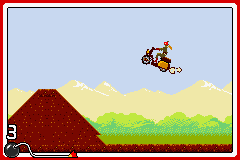 The player must use the to turn the motorcycle in midair, making it land on both wheels. 1st level difficulty: The motorcycle lands on an uphill road. It is at roughly the same angle as the motorcycle after it jumps, so little turning is required. 2nd level difficulty: The target is a flat platform, so the player must turn the motorcycle approximately 90° forward to land it safely. 3rd level difficulty: The target a downhill ramp. Since it inclines at the opposite angle the motorcycle is at, the player must turn the motorcycle forward a lot to land correctly. This page was last edited on September 27, 2018, at 13:29.